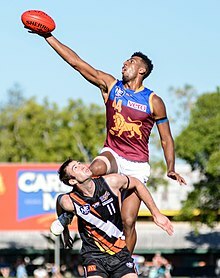 Australian rules football, officially known as Australian football,  or simply called Aussie rules, football or footy, is a contact sport played between two teams of eighteen players on an oval-shaped field, often a modified cricket ground. 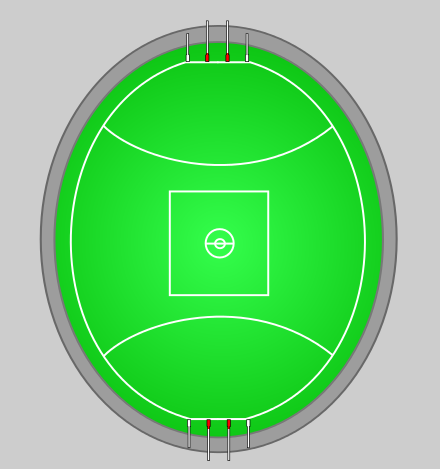 Points are scored by kicking the oval-shaped ball between goal posts (worth six points) or between behind posts (worth one point). An Australian rules football playing field is a venue where Australian rules football is played. During general play, players may position themselves anywhere on the field and use any part of their bodies to move the ball. The primary methods are kicking, handballing and running with the ball. There are rules on how the ball can be handled: for example, players running with the ball must intermittently bounce or touch it on the ground. Throwing the ball is not allowed and players must not get caught holding the ball. A distinctive feature of the game is the mark, where players anywhere on the field who catch the ball from a kick (with specific conditions) are awarded possession. Possession of the ball is in dispute at all times except when a free kick or mark is paid. Players can tackle using their hands or use their whole body to obstruct opponents. Dangerous physical contact (such as pushing an opponent in the back), interference when marking and deliberately slowing the play are discouraged with free kicks, distance penalties or suspension for a certain number of matches, depending on the seriousness of the infringement. 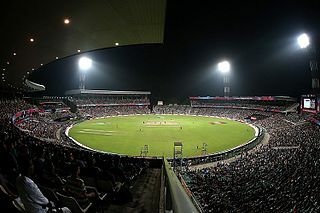 The game features frequent physical contests, spectacular marking, fast movement of both players and the ball and high scoring. A running bounce, or simply bounce, is a skill in the sport of Australian rules football when a player, while running, bounces the ball on the ground and back in their hands. During the early modern era pupils, former pupils and teachers at English public schools developed and wrote down the first codes of football, most notably the Eton College (1815) and Aldenham school (1825) football rules. The most well-known of these is rugby football (1845). British public school football also directly influenced the rules of Association football. Australian football has the highest spectator attendance and television viewership of all sports in Australia,   while the Australian Football League (AFL), the sport's only fully professional competition, is the nation's wealthiest sporting body. The AFL Grand Final, held annually at the Melbourne Cricket Ground, is the highest attended club championship event in the world. The sport is also played at amateur level in many countries and in several variations. Its rules are governed by the AFL Commission with the advice of the AFL's Laws of the Game Committee. St Kilda is an inner suburb of the metropolitan area of Melbourne, Victoria, Australia, 6 km south-east of Melbourne's Central Business District. Its local government area is the City of Port Phillip. At the 2016 Census, St Kilda had a population of 20,230. The rules were distributed throughout the colony; Thompson in particular did much to promote the new code in his capacity as a journalist. Australian football's date of codification predates that of any other major football code, including soccer (codified in 1863) and rugby union (codified in 1871). Football became organised in South Australia in 1860 with the formation of the Adelaide Football Club, the oldest football club in Australia outside Victoria. It devised its own rules, and, along with other Adelaide-based clubs, played a variety of codes until 1876, when they agreed to uniformly adopt most of the Victorian rules, with South Australian football pioneer Charles Kingston noting their similarity to "the old Adelaide rules". Likewise, Tasmanian clubs quarrelled over different rules until they adopted a slightly modified version of the Victorian game in 1879. The South Australian Football Association (SAFA), the sport's first governing body, formed on 30 April 1877, firmly establishing Victorian rules as the preferred code in that colony. The Victorian Football Association (VFA) formed the following month. In 1896, delegates from six of the wealthiest VFA clubs—Carlton, Essendon, Fitzroy, Geelong, Melbourne and South Melbourne—met to discuss the formation of a breakaway professional competition. Later joined by Collingwood and St Kilda, the clubs formed the Victorian Football League (VFL), which held its inaugural season in 1897. The VFL's popularity grew rapidly as it made several innovations, such as instituting a finals system, reducing teams from 20 to 18 players, and introducing the behind as a score. Richmond and University joined the VFL in 1908, and by 1925, with the addition of Hawthorn, Footscray and North Melbourne, it had become the preeminent league in the country and would take a leading role in many aspects of the sport. 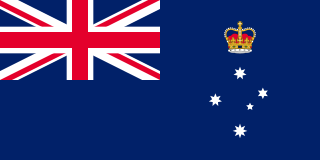 Both World War I and World War II had a devastating effect on Australian football and on Australian sport in general. While scratch matches were played by Australian "diggers" in remote locations around the world, the game lost many of its great players to wartime service. Some clubs and competitions never fully recovered. Between 1914 and 1915, a proposed hybrid code of Australian football and rugby league, the predominant code of football in New South Wales and Queensland, was trialed without success. World War I saw the game in New Zealand go into recess for three quarters of a century. In Queensland, the state league went into recess for the duration of the war. VFL club University left the league and went into recess due to severe casualties. The WAFL lost two clubs and the SANFL was suspended for one year in 1916 due to heavy club losses. The ANZAC Day clash, the annual game between Essendon and Collingwood on ANZAC Day, is one example of how the war continues to be remembered in the football community. With the lack of international competition, state representative matches were regarded with great importance. The Australian Football Council co-ordinated regular interstate carnivals, including the Australasian Football Jubilee, held in Melbourne in 1908 to celebrate the game's semicentenary. Due in part to the VFL poaching talent from other states, Victoria dominated interstate matches for three quarters of a century. State of Origin rules, introduced in 1977, stipulated that rather than representing the state of their adopted club, players would return to play for the state they were first recruited in. This instantly broke Victoria's stranglehold over state titles and Western Australia and South Australia began to win more of their games against Victoria. Both New South Wales and Tasmania scored surprise victories at home against Victoria in 1990. In 1982, in a move that heralded big changes within the sport, one of the original VFL clubs, South Melbourne, relocated to Sydney and became known as the Sydney Swans. In the late 1980s, due to the poor financial standing of many of the Victorian clubs, and a similar situation existing in Western Australia in the sport, the VFL pursued a more national competition. Two more non-Victorian clubs, West Coast and Brisbane, joined the league in 1987. In their early years, the Sydney and Brisbane clubs struggled both on and off-field because the substantial TV revenues they generated by playing on a Sunday went to the VFL. To protect these revenues the VFL granted significant draft concessions and financial aid to keep the expansion clubs competitive. Each club was required to pay a licence fee which allowed the Victorian-based clubs to survive. The football season proper is from March to August (early autumn to late winter in Australia) with finals being held in September and October. In the tropics, the game is sometimes played in the wet season (October to March). Pre-season competitions in southern Australia usually begin in late February. The AFL is recognised by the Australian Sports Commission as being the National Sporting Organisation for Australian Football. There are also seven state/territory-based organisations in Australia, most of which are now either owned by or affiliated to the AFL. Most of these hold annual semi-professional club competitions while the others oversee more than one league. Local semi-professional or amateur organisations and competitions are often affiliated to their state organisations. The similarities between Australian football and the Irish sport of Gaelic football have allowed for the creation of a hybrid code known as international rules football. The first international rules matches were contested in Ireland during the 1967 Australian Football World Tour. Since then, various sets of compromise rules have been trialed, and in 1984 the International Rules Series commenced with national representative sides selected by Australia's state leagues (later by the AFL) and the Gaelic Athletic Association (GAA). The competition became an annual event in 1998, but was postponed indefinitely in 2007 when the GAA pulled out due to Australia's severe and aggressive style of play. It resumed in Australia in 2008 under new rules to protect the player with the ball. Australian rules football was played outside Australasia as early as 1888 when Australians studying at Edinburgh University and London University formed teams and competed in London. Today, the sport is played at an amateur level in various countries throughout the world. Twenty countries participated in the Euro Cup and 23 countries have participated in the International Cup with both competitions prohibiting Australian players. Over 20 countries have either affiliation or working agreements with the AFL. There have been many VFL/AFL players who were born outside Australia, an increasing number of which have been recruited through initiatives and, more recently, international scholarship programs. Most of the current amateur clubs and leagues in existence have developed since the 1980s, when leagues began to be established in North America, Europe and Asia. The sport developed a cult following in the United States when matches were broadcast on the fledgling ESPN network in the 1980s. As the size of the Australian diaspora has increased, so has the number of clubs outside Australia. This expansion has been further aided by multiculturalism and assisted by exhibition matches as well as exposure generated through players who have converted to and from other football codes. In Papua New Guinea, New Zealand, South Africa, Canada, and the United States there are many thousands of players. Australian football has been an inspiration for writers and poets including Manning Clarke, Bruce Dawe and Philip Hodgins. Paintings by Arthur Streeton (The National Game, 1889) and Sidney Nolan ( Footballer , 1946) helped to establish Australian football as a serious subject for artists. Many Aboriginal artists have explored the game, often fusing it with the mythology of their region. Statues of Australian football identities can be found throughout the country. In cartooning, WEG's VFL/AFL premiership posters—inaugurated in 1954—have achieved iconic status among Australian football fans. Dance sequences based on Australian football feature heavily in Robert Helpmann's 1964 ballet The Display , his first and most famous work for the Australian Ballet. The game has also inspired well-known plays such as And the Big Men Fly (1963) by Alan Hopgood and David Williamson's The Club (1977), which was adapted into a 1980 film, directed by Bruce Beresford. Mike Brady's 1979 hit "Up There Cazaly" is considered an Australian football anthem, and references to the sport can be found in works by popular musicians, from singer-songwriter Paul Kelly to the alternative rock band TISM. Many Australian football video games have been released, most notably the AFL series. The 1901 Victorian Football League season was the fifth season of the elite Australian rules football competition. 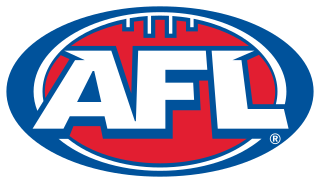 The Australian Football League pre-season competition, known during its history by a variety of sponsored names and most recently as the AFL Pre-season Challenge, was an annual Australian rules football tournament held amongst Australian Football League (AFL) senior clubs prior to the premiership season between 1988 and 2013. The pre-season competition culminated annually in a Grand Final and pre-season premier. In the Australian state of Victoria, the sport of Australian rules football is the most popular football code. The game's popularity in Victoria stems from its origins in Melbourne in the 1850s, with the first club and the first league both based in the city. Ten of the eighteen teams participating in the Australian Football League (AFL) are based in Victoria, as a result of the league's origins as the Victorian Football League (VFL). The Melbourne Cricket Ground, with a capacity of 100,024 people, is considered the "spiritual home" of the game, and hosts the sport's largest event, the AFL Grand Final, yearly. Australian rules football was invented in Melbourne, Australia, in 1858. The first match identified as a direct precursor to the codification of Australian football was organised and umpired by Tom Wills and contested on 31 July between Melbourne Grammar School and Scotch College, adjacent to the Melbourne Cricket Ground at the Richmond Paddock. The oldest surviving set of rules of Australian rules football were drawn up on 17 May 1859, three days after the formation of the Melbourne Football Club. The 1911 Victorian Football League season was the 15th season of the elite Australian rules football competition. The 1912 Victorian Football League season was the 16th season of the elite Australian rules football competition. The 1914 Victorian Football League season was the 18th season of the elite Australian rules football competition. The 1985 Victorian Football League season was the 89th season of the elite Australian rules football competition. This season commenced in March 1985 and concluded on 28 September 1985 with Essendon winning their second consecutive premiership in a third consecutive Grand Final against Hawthorn. The 1921 Victorian Football League season was the 25th season of the elite Australian rules football competition. The 1939 Victorian Football League season was the 43rd season of the elite Australian rules football competition. The 1948 Victorian Football League season was the 52nd season of the elite Australian rules football competition. Australian rules football was heavily affected by both World War I and World War II. Hundreds of leading players served their country abroad, and many lost their lives. On the home front, competitions like the Victorian Football League (VFL) went ahead during these wars, but faced many restrictions. 1 2 Collins, Ben (22 November 2016). "Women's football explosion results in record participation", AFL. Retrieved 22 November 2016. ↑ "About the AFL: Australian Football (Official title of the code)". Australian Football League. Retrieved 20 June 2017. ↑ Kwek, Glenda (26 March 2013). "AFL leaves other codes in the dust", The Sydney Morning Herald. Retrieved 18 December 2016. ↑ "AFL is clearly Australia’s most watched Football Code, while V8 Supercars have the local edge over Formula 1" (14 March 2014), Roy Morgan. Retrieved 18 December 2016. ↑ "The richest codes in world sport: Forget the medals, these sports are chasing the gold" (8 May 2014). Courier Mail. Retrieved 9 October 2016. ↑ Connolly, Rohan (22 March 2012). "Name of the game is up in the air in NSW". The Age . Retrieved 4 April 2012. ↑ Hess 2008, pp. 1–3. ↑ Pennings 2012, p. 8. ↑ Pennings 2010, pp. 13–14. ↑ de Moore 2011, pp. 86–87. ↑ Blainey 2010, pp. 19–22. ↑ Pennings 2012, p. 14. ↑ Blainey 2010, pp. 23–26. ↑ Ken Piesse (1995). The Complete Guide to Australian Football. Pan Macmillan Australia. ISBN 0-330-35712-3. p303. ↑ Paproth, Daniel (4 June 2012). "The oldest of school rivals". The Weekly Review Stonnington. Archived from the original on 3 December 2013. Retrieved 19 June 2013. ↑ Collins, Tony (2011). "Chapter 1: National Myths, Imperial Pasts and the Origins of Australian Rules Football". In Wagg, Stephen (ed.). Myths and Milestones in the History of Sport. Palgrave Macmillan. p. 14. ISBN 0-230-24125-5. ↑ Blainey 2010, pp. 187–196. ↑ Hibbins & Ruddell 2009, p. 8. ↑ de Moore 2011, pp. 322–323. ↑ Pennings 2011, p. 15. ↑ Pennings 2012, p. 11. ↑ Hibbins & Ruddell, pp. 14–15. 1 2 Coventry 2015, p. 2. ↑ Pennings 2011, p. 9. ↑ Hibbins & Ruddell 2009, p. 7. ↑ Hibbins & Ruddell 2009, p. 17. ↑ Hibbins & Ruddell 2009, pp. 10–12. ↑ Hibbins & Ruddell 2009, p. 11. ↑ Penings 2012, p. 25. ↑ Hibbins & Ruddell 2009, p. 20. ↑ Hibbins & Ruddell 2009, pp. 18–20. ↑ Hibbins & Ruddell 2009, pp. 22–23. ↑ Coventry 2015, pp. 16–17, 20. ↑ Hibbins & Ruddell, p. 9. ↑ de Moore 2011, pp. 87, 288–289. 1 2 Hess 2008, p. 44. ↑ Pill, Shane; Frost, Lionel (17 January 2016). "R.E.N. Twopeny and the Establishment of Australian Football in Adelaide". The International Journal of the History of Sport. 33 (8): 797–812. doi:10.1080/09523367.2016.1173033. ↑ Hibbins & Ruddell 2010, pp. 22–24. 1 2 Hibbins & Ruddell 2010, p. 24. ↑ Hibbins & Ruddell 2010, pp. 22–23. 1 2 Blainey 2010, pp. 107–108. ↑ Pramberg, Bernie (15 June 2015). "Love of the Game: Aussie rules a dominant sport in early Queensland", The Courier-Mail . Retrieved 24 April 2016. ↑ Healy, Matthew (2002). Hard Sell: Australian Football in Sydney (PDF). Melbourne, Vic. : Victoria University. pp. 20–28. ↑ Nauright & Parrish 2012, p. 351. ↑ Nauright & Parrish 2012, p. 351–352. ↑ "Football in Australia". Evening Post, Volume LXXXVIII, Issue 122. New Zealand. 19 November 1914. p. 8. Retrieved 3 December 2009. ↑ "Football amalgamation". Evening Post, Volume LXXXIX, Issue 27. New Zealand. 2 February 1915. p. 8. Retrieved 3 December 2009. ↑ "A False Dawn". AustralianFootball.com. 20 August 1908. Retrieved 19 February 2010. ↑ Marshall, Konrad (26 February 2016). "Where do rugby codes' strongholds turn to rules? At the 'Barassi Line', of course...", The Sydney Morning Herald . Retrieved 21 April 2016. 1 2 Nauright & Parrish 2012, p. 342. ↑ Nauright & Parrish 2012, p. 341. ↑ "'We need to work together': Tasmanians need united front for AFL team, researcher says" (21 August 2015), ABC News. Retrieved 2 November 2016. ↑ "Tasmania's AFL bid" (13 December 2008), AM, ABC Radio. Retrieved 2 November 2016. ↑ Cherny, Daniel; Wilson, Caroline (31 May 2016). "AFL 2016: St Kilda want two 2018 games in Auckland", The Age. Retrieved 1 November 2016. ↑ "Port Adelaide, Gold Coast Suns take AFL to China in 2017 regular season" (26 October 2016), ABC News. Retrieved 1 November 2016. ↑ "15.7 Free Kicks – Relating to Out of Bounds". Laws of Australian Football 2017 (PDF). Australian Football League. 2017. p. 51. Retrieved 22 June 2017. ↑ "AFL rules on deliberate rushed behinds". ↑ "All clear for rushed behind rule - Herald Sun". heraldsun.com.au. ↑ "Essendon v Melbourne". AFL Tables. 2 April 2016. Retrieved 28 June 2016. ↑ "AFL Match Statistics : Port Adelaide defeats Essendon at AAMI Stadium Round 1 Sunday, 28th March 2004". www.footywire.com. ↑ "AFL Match Statistics : West Coast defeated by Port Adelaide at Domain Stadium Round 2 Saturday, 3rd April 2004". www.footywire.com. ↑ "Greater Western Sydney v Geelong". AFL Tables. 1 July 2017. Retrieved 13 September 2017. ↑ "Wayback Machine" (PDF). 20 March 2007. ↑ "Bombers soaring on the Tiwi Islands". worldfootynews.com. Retrieved 11 November 2015. ↑ Mewett & Toffoletti 2008, p. 2. ↑ Hess 2008, p. 66. ↑ Hess & Lenkic 2016, pp. 1–6. ↑ Pippos 2017, p. 191. ↑ Halloran, Jessica (29 January 2017). "Will the AFL Women’s League level the playing field? ", The Daily Telegraph. Retrieved 28 April 2018. ↑ Mark, David (17 June 2016). "AFL women's competition provides a pathway for young women into professional sport", ABC. Retrieved 28 April 2018. ↑ "AFLX revealed: Who your club plays". AFL.com.au. 17 November 2017. ↑ Haxton, Nance (3 January 2007). "Sounds of Summer: International Rules Series". PM, ABC Radio National. Retrieved 1 May 2016. ↑ Williamson 2003, pp. 138–140. ↑ Roffey, Chelsea (30 July 2008). 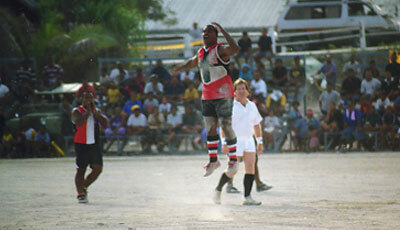 "Team Profile: Nauru Chiefs". Afl.com.au. Archived from the original on 25 January 2009. Retrieved 19 February 2010. ↑ Rith Basu, Ayan Paul (2 November 2015). "Soccer city gets a taste of Aussie football" . Retrieved 3 November 2015. ↑ Angel, Anita (23 November 2009). "Looking at Art" Archived 23 May 2014 at the Wayback Machine , Charles Darwin University Art Collection & Art Gallery. Retrieved 23 May 2014. ↑ Worrell, Shane (3 April 2010). "Modern footy not in tune", Bendigo Advertiser . Retrieved 5 December 2013. ↑ Derriman, Philip (22 May 2003). "If you can kick it, Australia will watch it". The Sydney Morning Herald . ↑ Bowen, Nick (25 August 2016). "The membership ladder: Hawks overtake Pies, Dons slide". AFL. Retrieved 28 September 2016. ↑ Hickman, Arvind (29 November 2016). "AdNews analysis: The top 50 TV programs of 2016", AdNews. Retrieved 12 April 2017. ↑ Styles, Aja (2 October 2016). "AFL Grand Final 2016 has highest footy ratings for Channel 7 in a decade", The Sydney Morning Herald. Retrieved 2 October 2016. 1 2 Niall, Jake (20 June 2007). "More chase Sherrin than before". Real Footy. Archived from the original on 4 February 2009. Retrieved 19 February 2010. ↑ "AFL Hall of Fame and Sensation". Getaway.ninemsn.com.au. Archived from the original on 22 May 2008. Retrieved 19 February 2010. Wikimedia Commons has media related to Australian rules football . Wikivoyage has a travel guide for Australian Rules Football .